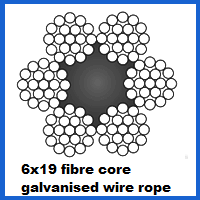 Designed to offer improved flexibility and a lighter weight than you might expect from a galvanised wire rope, this 6×19 construction product is equipped with a fibre core and is produced with a diameter of 4mm for even more varied use cases. Read on for more about 4mm 6×19 Galvanised Wire Rope. The thickness of this rope may seem minimal, but its load capacity speaks volumes about just how tough it can be. The WLL tops out at just over 980kg and it has a breaking force rating of 9.63kN in its highest quality variant. With a fibre core instead of a steel wire core, the rope will be fairly malleable and is protected from the elements thanks to the galvanised coating that is applied to the steel strands during production. Rain water, sea spray and generally moist conditions will not pose a problem for this rope, making it good for aesthetic architectural use as well as in more overtly practical situations. Our site is stocked with great wire rope products, along with every conceivable kind of fitting that you might require. Better still, if you do not want to attach add-ons like thimbles and ferrules yourself, you can rely on Rope Services Direct to complete the installation for you when you order 6×19 galvanised rope. Whether you email us your details and ask a question or get in touch with RSD over the phone on 01384 78004, contacting our friendly team will be the best way to find out more about our products and services. 4mm 6x19 Galvanised Wire Rope Overall rating: 5 out of 5 based on 6 reviews.